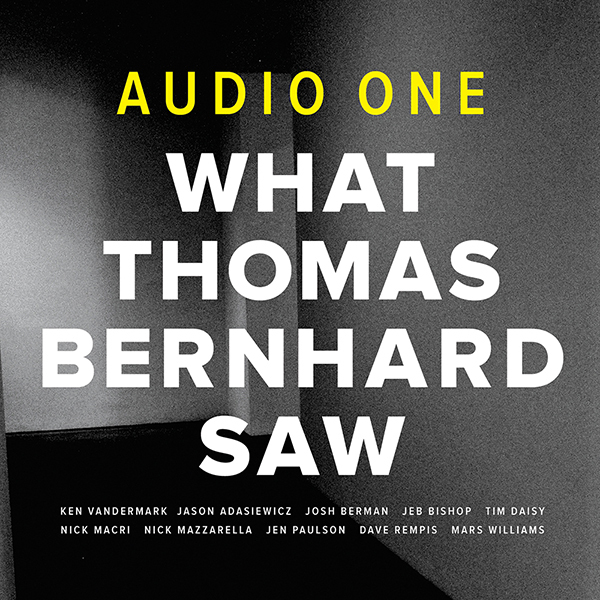 Inspired by Austrian writer and critic Thomas Bernard, Ken Vandermark (interview) reconvenes his modern jazz large ensemble, featuring some of Chicago’s finest musicians into a powerhouse ten-piece band that can be seen as something of an extension of Peter Brotzmann’s now defunct Tentet. The music was recorded live in April of 2014 and the energy of an in-person performance pervades the music, beginning with “Doble Negacion (for Michael Heizer).” Opening with a slow and ominous start, the music is allowed to hang unadorned in space and time. The pace builds gradually and patiently before strong and proud horn riffs make themselves heard. Vibes develop crystalline patterns over the building chaos as a tenor saxophone takes flight for a solo that is fast and thrilling, nearly audacious in its execution. When it is swallowed back into the fold there is an interlude for sputtering trumpet , egged on by the other horns, and then (bass?) clarinet alternating between clicks and pops and squalls with piercing wails. A lengthy and very exciting tenor saxophone improvisation aided by beautiful bass concludes the first movement. The second track, “Boxers and Dancers (for Getachew Mekuria and Melaku Belay)” comes out with a fleet and funky feel, light and nimble with the horns blaring in a happy fashion, unleashing a torrid solo for alto saxophone that steps on the gas and becomes simply rousing in its nature. The band itself is a living organism that expands and contracts as needed as solos emerge and fade, and every musician supports the other without ego. A fine interlude for trumpet and a return to some more scalding alto saxophone improvisation leads the music to its conclusion. “Uitgraving (for Willem de Kooning)” has an abstract beginning with the percussion developing an interesting rhythm before a massive clarion call of saxophone erupts amidst the clangs and fractured beats. High pitched plucked and bowed viola adds for an interesting texture to the music, before a massive choppy full band midsection erupts, with monstrous slabs of noise backing the listener into a corner before suddenly and completely unexpectedly dropping the guise into a final section of brushed percussion and lush, nourish saxophone that is so unlike what preceded it that it leaves you gobsmacked. The album is completed with “Tape (for Robert Irwin)” where the band comes blasting out with a riffing fanfare. Rippling vibes try to tame the beast but to no avail as saxes break out and wail to the point of overblowing before slipping back and flittering about like a flock of birds, A section for trombone and vibraphone is quite beautiful, and a supremely confident and excellent tenor saxophone solo (presumably Vandermark’s) leads the band home to a victorious conclusion. This was a very successful album, and the Audio One outfit has become one of Ken Vandermark’s finest groups of recent years. It is a collection of top notch talent that is given the guidance of interesting compositions, and the latitude to interpret it in their own individual way. This is a big band format that is as old as Duke Ellintgon and Count Basie, but brought forth into the 21st century with tremendous results. 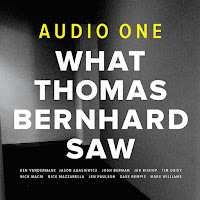 What Thomas Bernhard Saw - Bandcamp.